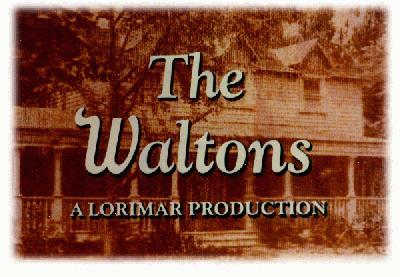 As a friend of The Walton's, I would like to welcome you to our family and share this memory with you. Someone once asked my sister, Marion, where Walton's Mountain was, and she answered, "It's a place where my brother was happy." I remember my childhood. We were in a depression, but we weren't depressed. We were poor, but nobody ever bothered to tell us that. All we knew was that we suffered an absence of money, but that didn't bother us. We were too occupied with the day to day events. To a skinny, awkward, red headed kid who secretly yearned to be a writer, and kept a journal of events, each of those days seemed filled with wonder. And as I look back they still do. I remember that the end of winter would come late. First the icicles would melt along the eves of the house and gradually the layers of snow on the north end of the barn would disappear. Sometimes my mother's yellow, blue and white crocus would become impatient and push their heads through the snow on each side of the front walk. Then March! Time to climb Witt's Hill again with kites made of brown wrapping paper and flown on string which had been collected for that purpose all winter long, then the blossoming of the dogwood and redbud and forsythia which told us that Spring had come again. Summer would arrive and with it crickets and blue birds and cousins from Richmond and Petersburg, up for a visit. We would go barefooted and catch fireflies in the twilight. After darkness fell we would sit on the front porch and listen to ghost stories told by our grandparents. Some nights my father would take the whole gang down to Drusilla's Pond to catch blue gill and bass. There were two sisters who had drowned there, but we would leave before their ghosts were said to come out with the darkness. Some nights my father would call up bob white quail and lure them to the edge of the porch. On Sundays we would drive over to Uncle Benny Tapscott's farm in Buckingham County. He would let us go down to his spring house and bring back chilled watermelons and cantaloupe. We would eat them in the yard and spit the seeds on the ground. Every night there was something good to listen to on the radio. The whole family would gather to listen to "One Man's Family", or Charlie McCarthy ribbing Edgar Bergen or Gene Autrey singing "I'm Back In The Saddle Again". And one memorable night President Roosevelt reassured an apprehensive nation that "all we have to fear is fear itself". With the coming of Fall we learned to wear shoes again. We would gather chinquapins and black walnuts in the woods and bring them home in bushel baskets. And when the frost killed the vines we would gather the last of the green tomatoes from the garden and the following day my mother's kitchen would be filled with the pungent aroma of green tomato relish. With September came school again, and autumn color and the aroma of burning leaves. Finally the long silent Winter would be upon us. Under my parents supervision, my brothers and sisters and I would gather around the long wooden kitchen table and do our homework until one by one we drifted off to bed. And there with the house in darkness, we would call good night to each other, and then go to sleep in the knowledge that we were safe, secure, home. I hope you enjoy this Web site and it reminds you of your favorite episode of The Waltons. Earl Hamner.